Since 2007, scientists have been picking up mysterious radio blips, or fast radio bursts (FRBS), that originated somewhere in deep space. Nobody knows what's causing them, but scientists have theories—one of which was dashed to pieces last week. Until now, scientists believed these bursts were isolated, singular events–one-time explosions from the distant corners of the universe…. [but] astronomers now confirm that at least some of these FRB sources emit repeated pulses. Jill Tarter, who once served as director of the SETI Institute, told New Scientist that FRBs "have been intriguing as an engineered signal, or evidence of extraterrestrial technology, since the first was discovered." But scientists aren't jumping to the conclusion that these bursts are coming from aliens. The Cornell researchers suggest that faraway neutron stars are likely the source of these FRBs. Co-author James Cordes said that "we’re detecting these FRBs from very far away, which means that they are intrinsically very bright. 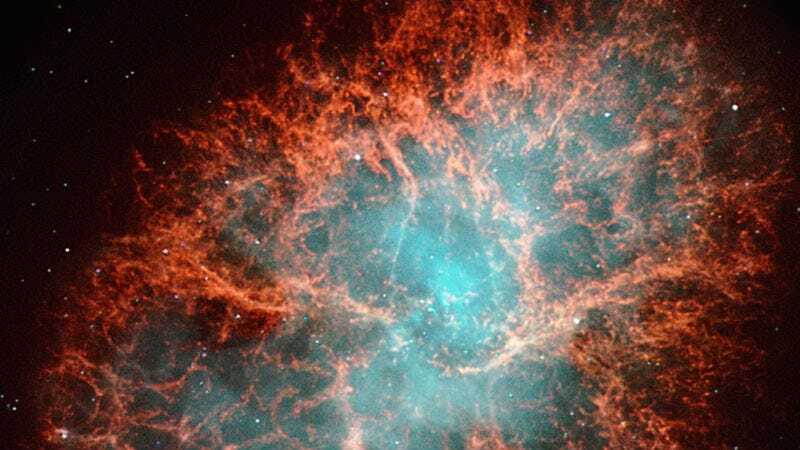 Only a few astrophysical sources can produce bursts like this." Every day, an estimated 10,000 FRBs flash across the sky. In their brief, millisecond-long appearance, they release as much sun as the sun emits in 10,000 years. But their short duration and unpredictable arrival makes observing them a challenge. On 24 February, astronomers announced that they had identified the origin of an FRB in a galaxy 1.9 billion parsecs (6 billion light years) away, probably produced by a collision between two neutron stars… But two days later, astronomers Edo Berger and Peter Williams argued in a paper posted on the preprint server arXiv that the afterglow could, in theory, have come from a periodic radio-wave flare-up at the galaxy’s core, where matter spirals into a supermassive black hole. New, powerful telescopes (slated to start operating this year) could make it easier to detect FRBs and draw conclusions about their origins. So probably don't plan on getting intergalactic messages from smart aliens. But you never know. The truth is out there.